Building off a killer tagline. We had the pleasure of meeting Charles & James through a referral. Most people would assume Lawyers are an uptight and very serious bunch. These guys are far from that stereotype. They have exceptional personalities and am amazing sense of humour that captivated me from the moment we shook their hands. Bosecke Song LLP is a long standing law office of Edmonton, well over 25 years. They had been operating their business without any identity and were looking to give themselves an image. They asked Wake Creative to come up with some ideas on how they can create an image that truly spoke who they are. We were happy to tackle this problem. We sat down with the senior staff of Bosecke Song LLP to better understand their business and what made them different from other offices in Edmonton. We discussed their process, philosophy and how they saw themselves compared to everyone else. During this discovery meeting we learned that they had hired a copy writer to develop content for their website. In that process their copy writer developed a tagline for them. Once Charles & James shared it with us, we immediately got excited. At first, they weren’t sold on the idea of that tagline, but after they saw our excitement, they knew it was a good idea. We got hard to work developing ideas around this killer tagline. 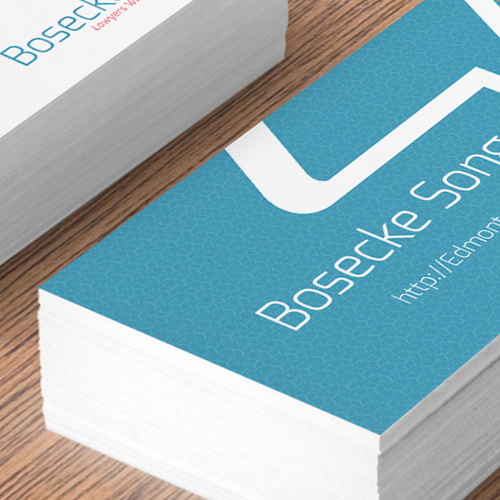 After completion of Bosecke Song LLP’s logo, we developed a great looking business card and letterhead for their business. Their logo had some great qualities – negative space and abstract look when increased in size. Their logo created a great looking pattern so I gave their business cards & letterhead a touch of sophistication with a patterned background. When we decided on colours and typefaces we wanted to bring a fresh calming look to their business. Most lawyer offices play with the same colours – muted browns, dark reds, blue and green. Bosecke Song LLP didn’t fit into this playground. We came up with a fresh colour palette that was calming but fun. With their typeface I opted for a modern font that was a bit edgy while keeping readability true. We capped everything off with an Identity Guideline Manual. After hours of research and pages of sketches, we came up with a solution that embodied our philosophy on logo design. 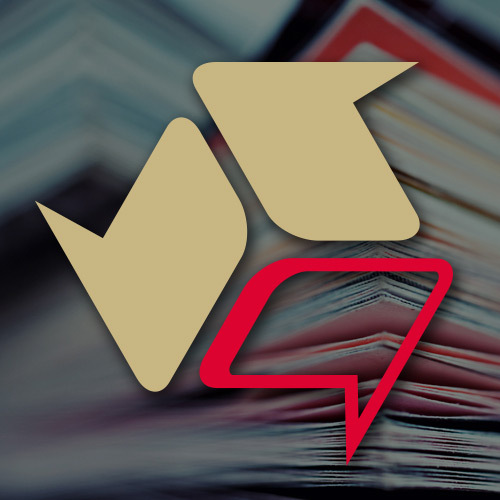 It was clean, versatile, had impact and also told a story about Bosecke Song LLP. Building off their tagline “Lawyers Without the Jargon” we came up with the idea of a speech bubble. But we went further with this concept by creating it into a stylized triskelion symbol. The triskelion is a greek 3-legged symbol that means forward movement-progress. 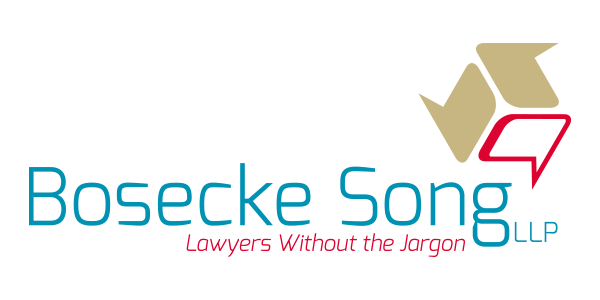 We viewed Bosecke Song LLP as a progressive company that broke from the typical mould of most lawyer offices. They are down-to-earth people that made the process easy for clients. They speak in simple terms, never pressuring their clients. They are always looking for new technologies to progress their company. Incorporating applications or software whenever they can. Trying to become a paperless office. These qualities were a natural fit for this historical symbol. It can be very difficult to coordinate the schedules of 4 lawyers, so we were very appreciative of Dennis’ flexibility with setting a meeting date. After the meeting, all of the other lawyers commented to me that they were impressed with the fact that Dennis was well-prepared and succinct in his presentation. The partners have mentioned to me numerous times that they were very impressed by Dennis’ professionalism, efficiency and results. As a junior associate of Bosecke Song LLP, pioneering the firm’s rebranding could have been a risky move. Because of Dennis’ great work, the partners are also quite impressed with me, so thank you, Dennis! I would gladly without hesitation recommend the services of Wake Creative.